This is a concept paper and proposal developed by students, faculty and local community members participating in the Special Topics class PLSOIL 297S �Developing a Sustainability Curriculum�. Drs. Robert Bernatzky and John M. Gerber organized this class at the request of the Department of Plant and Soil Sciences Sustainability Committee. Their charge was to solicit guidance and input from students who are currently pursuing an education focused on sustainability. This concept paper and proposal is being submitted to that departmental committee for further consideration and action. It is also being submitted to the Faculty Senate ad hoc Committee on Sustainability - Academics and Curriculum Subcommittee, at the request of members of the class. We hope both committees find our work useful in their further deliberations. The next generation of students graduating from American public universities will be faced with an unprecedented challenge to redesign nearly every major natural resource based system on the planet. These women and men will inherit systems of industrial and technological growth that are simultaneously destroying or depleting much of nature and endangering human and non-human species, while offering the highest material standard of living and rate of consumption ever known. These modern systems of industrial and technological development must be re-imagined and re-created in ways that no longer rely on non-renewable resources, use natural resources at non-sustainable rates, or cause harm to people or the natural world, now or in the future. As we begin this task, we must clarify core community values so that science and technology may be guided to serve the needs of present and future generations. This work will require skills, knowledge and wisdom not currently central to the academic enterprise. Education for sustainability will be needed to help redesign food and farming, energy production and consumption, and waste handling and reuse systems. At least one generation will be needed to build learning communities and social structures that support the changes that must occur in our daily lives as we learn to live more sustainably on the planet. Today�s graduates of the Department of Plant and Soil Sciences and other science based disciplines are generally prepared to address problems and opportunities from both a practical management and a theory-based perspective at the organism, organ, cellular and molecular levels. Graduates in the future will also need to understand complex food and agricultural systems at the population, community, and ecosystem levels. Studies of social systems must complement studies of biophysical systems at these higher levels of complexity. A new set of academic and experiential education is required for the students of sustainability. Therefore, we are proposing a new Sustainability major be developed by the Department of Plant and Soil Sciences at the University of Massachusetts Amherst in cooperation with other appropriate academic units. This proposed curriculum development project must go beyond offering new skills, knowledge and wisdom to individuals. It must also nurture the emergence of new societal structures (including university learning systems) that support the evolution of sustainable ways of living and learning. A new curriculum for sustainability must be part of a total systems change at the university as described in �Education for Sustainability: The University as a Model of Sustainability� by Anthony Cortese (see Appendix I). While this concept paper and proposal was developed at the invitation of the Department of Plant and Soil Sciences, we believe it will be useful in other academic departments as they also consider curricular changes in support of the quest for long-term sustainability. It is our collective hope that a group of academic departments at the University of Massachusetts Amherst develop unique but interrelated majors to provide students with the opportunity to study sustainability. We can imagine these majors to be based in disciplines such as agriculture, engineering, art, economics, health, and more. � Sustainability addresses the university mission of serving the public good in ways that are explicitly dedicated to economic viability, environmental integrity and social equity. The sustainability of the university itself will depend on this generation�s foresight and ability to adapt to a changing world by creating relevant future-focused educational programs. Sustainability is not only the responsibility of the public university, it may be its best chance to demonstrate continued social relevancy at a time of increasing public scrutiny. � A Sustainability major will complement and build upon current the strengths of the Department of Plant and Soil Sciences. Studies in Plant and Soil Sciences are largely focused on environmental quality and economic viability. The proposed new Sustainability major will complement these objectives by incorporating social equity as an additional primary educational focus, and integrating all three objectives through holistic studies. This new major will require partnerships with faculty and professionals outside of the Department and University, and therefore encourage others to focus their own efforts on long-term sustainability as well. � There is significant student interest in learning about sustainable solutions to the many economic, biophysical, and social challenges of our time. This demand for sustainability studies extends to a desire to find or create meaningful work that addresses these challenges. Employment opportunities in agriculture and natural resource management today require attention to environment and social issues. We believe this demand will continue to grow, thereby affording employment opportunities to the graduates of this program. These 3 reasons are more fully described in the next section. 1. Sustainability education addresses the public university mission in ways that are explicitly focused on economic viability, environmental integrity and social equity. Few would argue with the idea that public universities have a responsibility to serve the public good, however there is not widespread understanding of the concept of �the public.� Some would argue for example, that the primary public role of universities is to generate skilled workers for the corporations and businesses of the nation. In this case, businesses that provide employment to graduating seniors would be seen as �the public.� We believe this viewpoint is incomplete, as employability is but one of the important outcomes of a university education. Also, potential employers are not necessarily representatives of the public good, but rather of their own special interests. We propose a Sustainability major would not only provide employment and serve the labor demands of businesses and corporations, but would also address other aspects of public good. A more complete understanding of �public good� would include attention to common human interests rather than private benefits. Among those common interests we think important are: affordable, nutritionally adequate food; adequate and affordable clothing and shelter; a healthy, livable environment; a means to provide for one�s livelihood, personal growth and community health; accessible health care; and accessible educational opportunities. We believe that employability of graduating students is a necessarily but not sufficient means serving the public good. We believe the multiple sustainability objectives of economic vitality, environmental integrity and social equity may be best addressed by focusing on university education that clearly addresses the basic human needs of all people, now and into the future. We are hopeful the University of Massachusetts Amherst will accept the challenge of the (former) President�s Council on Sustainable Development Public Linkage, Dialogue and Education Task Force which called for ��changes in the formal education system to help all students, educators, and education administrators learn about the environment, the economy, and social equity as they relate to all academic disciplines and to their daily lives.� (For the full report of the President�s Council on Sustainable Development see; http://clinton2.nara.gov/PCSD/Publications/TF_Reports/linkage-top.html). This government task force made a case for educational reform that would strengthen sustainability education by integration of traditionally disparate discipline-bound teaching through interdisciplinary approaches and systems (holistic) thinking. Further, they proposed that sustainability education should be encouraged through experiential, hands-on learning. Many universities have accepted this challenge and created new programs, courses, and pedagogies to meet the societal need for sustainability education while at the same time fulfilling their fundamental mission of serving the public good. We are hopeful that UMass Amherst will join this progressive group of universities. 2. A major in sustainability will complement and build upon the current strengths of the Department of Plant and Soil Sciences. The PSS Department description states �Plant and Soil Sciences, through the combined study of plants, soils, and the environment prepares students for an active role promoting the quality of life through environmentally conscious and socially responsible management of plant and soil resources.� We agree with this statement and would add that the quest for sustainability must include not only management of plant and soil resources, but also must include management of personal decision-making processes while building equitable social relationships. Sustainable development should not be limited to the development of biophysical resources, but must include development of social and personal resources and capacities as well. The PSS Departmental description further states that �students in Plant and Soil Sciences learn effective techniques for land and crop management, growing and breeding plants, reducing pesticide use, and using plants and soil microorganisms to remove environmental contaminants from ecosystems.� Again we agree, and would like to add that sustainability requires all of this plus an understanding of this work from a complex systems (or holistic) perspective. It is not enough to manage plants, animals, soils, pests, water, and minerals. They must be understood as part of a complex agricultural ecosystem in which farmers, suppliers, shippers, food handlers, retailers, consumers, public agencies, businesses and other socially created institutions play a role. Finally, the PSS departmental description states, ��the undergraduate curriculum in Plant and Soil Sciences is unique, developed so that students can tailor course work to best reflect individual academic interest and career goals�. We agree that sustainability education includes a focus on academic interest and career goals. However in addition, sustainability education prepares a student both for �making a living� as well as for living in a more sustainable way. Sustainability education goes beyond preparation for a career, and prepares humans to live on the planet in a way that doesn�t jeopardize opportunities for others alive today or for future generations. For these reasons and more, students at UMass have decided to create their own programs of study in sustainability. The current options for departmental majors at UMass Amherst do not provide an adequate opportunity to study sustainability in its full and broadest sense. One BDIC major noted �I transferred to UMass last fall after completing my Associates Degree. UMass-Amherst attracted me because of the Sustainable Agriculture program in the Plant and Soil Sciences Department. Having known for several years what career path I want to pursue, I thought that this degree would best prepare me. What I have instead discovered is that while I would graduate with a strong knowledge of current, large-scale agricultural trends and large-scale corporate organizations, a large gap would be left in my education. The current Sustainable Agriculture program is more about production agriculture than sustainability. By designing an individual concentration through BDIC, my hope is to �fill in� this gap.� This message was heard from BDIC students who switched from other academic departments as well. Students who wish to prepare for a lifetime of work toward sustainability have opted for the Bachelor�s Degree with Individual Concentration (BDIC) program. We believe this expression of demand, coupled with the increasing number of employment opportunities is further reason for creation of a new Sustainability major at this time. The next section describes our understanding of the scope of education for sustainability. � Artists, to help us feel the gravity of our situation, to help us envision a more beautiful and sustainable way of life, and to inspire us to strive for better things. � Scientists and engineers, to find solutions, new �green� practices and products, and breakthrough ideas that can rapidly transform our unsustainable way of life. � Designers, to redesign virtually every human construction and system, and to fuse beauty and functionality in a transformed and sustainable world. � Business people, to re-imagine and redirect the flows of money and investment and talent in ways that can recreate the world while enhancing global prosperity. � Activists, to call attention to those issues about which societies at large are in denial or unable to act on because of systemic or controlling forces. � Professionals, such as those in healthcare, the law, or international development, to change the standards of practice in their profession to first �do no harm�, and to lend their considerable weight to a global movement. � Average citizens, to re-imagine themselves as global citizens, to enthusiastically support change efforts, and to dare to reach for their own aspirations for a better world. � Politicians, to motivate us with a true spirit of democracy, to frame new policies that encourage transformation, and to remove bureaucratic obstacles to innovation and change. � Educators, to prepare current and future generations for a great responsibility: directing human development toward sustainability. While the education of all these people is well beyond the capacity of any one academic discipline, we believe the Department of Plant and Soil Sciences can make a significant contribution to education for sustainability related to land, food and farming systems. We believe that by working in partnership across many departments at the University of Massachusetts Amherst, a comprehensive and holistic curriculum may be created to serve the needs of undergraduate students interested in learning to live more sustainably on the earth. We are hopeful that other departments will join Plant and Soil Sciences to create majors in the area of sustainability as well. The next two sections present a model for sustainability and a template for curricula development that we hope will be useful toward this end. 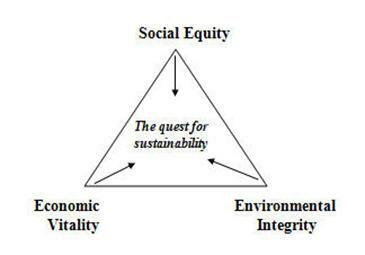 A widely accepted conceptual model presents sustainability as a quest toward three interrelated objectives: 1) environmental integrity; 2) economic vitality; and 3) social equity. We believe people should be encouraged to begin thinking about sustainability from any of these three perspectives. We should engage people �where they are at� and incorporate the thinking of many viewpoints as we �move toward the center� of the sustainability triangle. The sustainable economic view � sustainability is the efficient use of human and natural resources within the global marketplace, with minimum harm to the natural environment, local communities, and people. This view currently dominates university education for sustainability, yet is incomplete. The sustainable biophysical view � sustainability is a way of manipulating the world to achieve both permanence and productivity. (See Appendix III, Educating for the Environment, on how this view would change university education). The sustainable social view � sustainability is a way of life that supports all humans and viable communities today and to the 7th generation. (See Appendix IV, Equity and the Environment for more). The sustainable holistic view � sustainability is an integrating paradigm for understanding complex human and non-human systems. It includes and integrates all the other views, providing meaning and spirit to the work. (See Appendix V, Sustainability Science; and Appendix VI, The Quiet Dawn). This four-part model of may be used for the development of a sustainability curriculum based in any academic discipline. Attention must be paid to all three corners of the triangle as well as the integrating process at the center that we called holistic studies. A sustainability curriculum should include academic courses and/or educational experiences from all four sectors of the model. 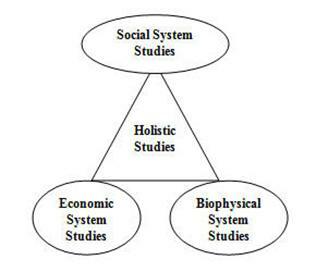 Since the concept of holistic studies is not familiar in some academic arenas today, further explanation may be useful. According to an April 2001 article in Science (see Sustainability Science; Appendix V), the science community has generally ignored societal and political issues affecting the sustainable development. This estrangement from so-called �non-scientific� issues has prevented the research and education establishment from making significant contributions to global sustainable development. The authors of this article call for a new sustainability science that is different in �structure, methods and content� from the science of the past. Specifically the new sustainability science will need to approach problems from a holistic perspective that: 1) transcends spatial scales from economic globalization to local farming practices; 2) accounts for temporal inertia of global affects such as atmospheric ozone depletion and the movement of toxins; 3) deals with the functional complexity of interacting systems and subsystems; and 4) recognizes and honors a wide range of divergent opinion within the scientific community and between science and society. Sustainability science calls for new integrative processes that bridge science and politics, nature and society, and developed and developing nations. Finally, sustainability science will use participatory procedures to engage scientists, stakeholders, advocates, active citizens, and users of knowledge in the inquiry process. We believe this perspective from the author�s of the article in Science is a call for systems thinking or holistic studies. Course work in holistic studies might include: leadership development, spirituality, holistic and integrative courses, systems thinking, community studies, and particularly experiential education. At the heart of our proposal is a recommendation to require students have at least one semester of experiential education (described below). The next section describes the national movement toward sustainability education. The Association of University Leaders for a Sustainable Future (ULSF) was created by a group of academic leaders. Presidents and other administrative leaders from about 280 universities around the world have signed the Talloires Declaration in support of sustainability education and operations. The mission of ULSF is to make sustainability a major focus of teaching, research, operations and outreach at colleges and universities worldwide. ULSF pursues this mission through advocacy, education, research, assessment, membership support, and international partnerships to advance education for sustainability. According to ULSF ��higher education is beginning to recognize the need to reflect the reality that humanity is affecting the environment in ways which are historically unprecedented and which are potentially devastating for both natural ecosystems and ourselves. Since colleges and universities are an integral part of the global economy and since they prepare most of the professionals who develop, manage and teach in society's public, private and non-governmental institutions, they are uniquely positioned to influence the direction we choose to take as a society. As major contributors to the values, health and well being of society, higher education has a fundamental responsibility to teach, train and do research for sustainability.� The Talloires Declaration and more about ULSF can be found at: http://www.ulsf.org/. � Second Nature Inc. is another educational non-profit dedicated to accelerating a process of transformation in higher education. While Second Nature will change in the near future due to budget constraints, for some time they have guided and nurtured higher educational institutions in their quest to make sustainability an integral part of the institution. Second Nature Inc., states, ��we must reinvent the world socially, economically and environmentally. A sustained, long-term effort to transform education at all levels is critical to the change in mindset necessary to achieve this vision. Higher education has the power to lead in this endeavor by exercising its role in training future leaders, teachers and other professionals and in producing wisdom needed to face the challenges of an increasingly complex world.� Second Nature has maintained an extensive database, with examples of sustainability programs, courses and curricula at: http://www.secondnature.org/. For more than a decade, National Wildlife Federation�s Campus Ecology Program has been helping transform the nation's college campuses into living models of an ecologically sustainable society, and training a new generation of environmental leaders. They are at: http://www.nwf.org/campusecology/. The International Institute for Sustainable Development provides tools for campus leaders and educators wanting to incorporate sustainability into campus operations as well as the curriculum. They are at: http://iisd1.iisd.ca/educate/. HENSE, the Higher Education Network for Sustainability and the Environment, is a new North American network of individuals and organizations from academia, associations, government, non-profits, community interests and business who are dedicated to improving the quality of life for all through the realm of higher education. They are at: http://www.hense.org/. Anthropology 208: Human Ecology - The study of human/environmental interactions. Emphasis is on biological and cultural responses by contemporary human groups to pervasive environmental problems. Economics 308: Political Economy of the Environment � Application of the theories of political economy to environmental problems and issues. Topics include regulatory and market approaches to pollution and natural resource depletion; cost-benefit analysis and its economic and political foundations; and case studies of specific environmental problems such as acid rain, deforestation, and global warming. Plant & Soil Sciences 297A (soon to be 265): Sustainable Agriculture � Ethical, practical and scientific aspects of the quest for long-term agricultural sustainability. Students learn about the economic, social and environmental impacts of food production systems and how personal choices, technology, and policy impact sustainability. In addition to these few examples, we have identified courses that contribute to sustainability education in the following academic departments at UMass Amherst. Many of these courses are listed below. It is clear from our investigation that many UMass courses currently available contribute to education for sustainability. � Policy and Advocacy � this includes work for non-profit advocacy and educational organizations, government agencies, university research centers, and personal citizen involvement in political and community change efforts. � Community Engagement � this includes working directly with people and groups in community. Examples are community gardens, anti-hunger coalitions, environmental protection efforts etc. � Educational - this includes youth education, citizen education, non-profit educational organizations, media work, and formal teaching. � Farm Manager � this includes knowledge of sustainable and organic plant and animal production systems. We believe this need is not adequately served by the current Sustainable Agriculture track within the Plant and Soil Sciences major and should be re-examined considering our model for sustainable education (above). We believe a Sustainability major should provide adequate flexibility for students to create a course of study that would prepare them for any of these four areas. At the same time, we believe that specializing too narrowly would be a mistake. Sustainability education should prepare students for a lifetime of work by learning basic principles, integrating multiple disciplines, and learning how to learn. Since most adults today change their work many times during a lifetime, sustainability education should prepare people for continued growth and learning rather than for entry positions in a chosen field. We believe all academic courses offered as part of a sustainability curriculum should be evaluated for their contribution to this set of skills, knowledge and wisdom. While we recognize this is an incomplete list based on our experience and analysis, we believe it is more than adequate as a beginning for evaluation of courses that might contribute to a new curriculum. The next section offers some ideas on specific course content. We recognize this �wish list� presents a challenge to the current academic system, yet we are confident in the creativity and dedication the faculty, students, and staff at the University of Massachusetts Amherst. Many of these topics are already being taught in courses at UMass. Others are being considered. As we review the course offerings in many academic departments, we recognize that much of what is needed is already available, however it is not organized into a curriculum. We believe this is the immediate challenge and opportunity. Creating new courses specific to the Sustainability major, as needed. Reshaping existing courses to include new course content. Integrating transformative teaching methodologies in both new and existing courses through a shift in pedagogy and inclusion of an experiential component. The following two sections describe the pedagogy of sustainability education and some thinking on the need for experiential education. We believe the evolution of new transformative teaching methodologies and learning objectives may have the greatest impact on education for sustainability in the long run. Current undergraduate education focuses primarily on building knowledge within a specific academic discipline. Sustainability education on the other hand, requires a broad set of learning that integrates multiple disciplines with new practical skills and the evolution of personal and community wisdom. Lacking wisdom, knowledge can be dangerous. Human knowledge, for example, has built weapons capable of destroying everything we love. Human knowledge has degraded ecosystems and created cycles of poverty and despair. Knowledge "alone" cannot solve the problems that we have created. To solve the problems of humanity, we must go beyond knowledge. Today we need skills, knowledge AND wisdom (where wisdom is defined as the awareness of what has value in life). Developing wisdom will require the integration of thinking and feeling, mind and body, science and spirit, knowledge and values, head and heart. It will mean less time in classrooms and more time learning through experience. It will require pedagogy founded on a model of transformative learning that engages the student�s mind, body and spirit. Transformative education builds students� capacity to make meaning of their experiences, and reconstruct their notion of self beyond the individual-self to include the family-self, community-self, and global-self. Awareness of the connection between the individual, the community, and the cosmos are necessary attributes of education to prepare young people as leaders in sustainable world. We believe that learning �about� sustainability is not enough. Sustainability must be learned in the classroom as well as experienced. Most university programs are primarily grounded in a commitment to building instrumental knowledge, that is, knowledge about how the world works. Instrumental knowledge is used to manipulate the environment, and while important, it must be balanced by communicative knowledge of values, ideas, feelings and cultural concepts such as justice, freedom, equality and love. Communicative learning uses different teaching methods than instrumental learning and may rely on metaphors and analogies in addition to facts and data to unravel complex human and human-natural system relationships. Learning tools such as decision cases, dialogue, service learning and story telling are core to communicative learning. Lastly, while instrumental learning may thrive in hierarchical systems where the power of teachers is greater than students, communicative learning must occur in environments that support co-learning of both teachers and students. Therefore, we propose a Sustainability curriculum should be developed that focuses on both the content of learning (courses and topics) as well as the context of learning. The next section describes the necessity for an experiential component in a Sustainability major. We believe that learning outside of the classroom is a necessary ingredient of sustainability education. The National Society for Experiential Education (NSSE) defines Experiential Education as: �Teaching and learning methods that incorporate an applied component, allowing students to develop both knowledge and skills from their active participation in out-of-classroom settings. Service learning (community service that utilizes an academic framework), field studies (observations in natural settings), academic internships (application of theory to practice in work settings), cross-cultural education (learning through direct and significant involvement in another culture), and action research (research with practical outcomes on issues identified by a community) are a few examples of experiential education.� (See; http://www.nsee.org/). A critical aspect of education for sustainability is the ability to integrate theory and practice. This ability can�t be acquired by sitting passively in a classroom, listening to a lecture, or reading a textbook. We know that most adult learning (after graduation) is unstructured, random, and takes place as a result of living and making meaning out of everyday experience. However in much of our university education, knowledge is handed over to students in safe, officially approved packages to be handed back to teachers for evaluation and reward. The interchange of information between teachers and students is like a �mental handshake� in which a prescribed set of facts is passed from an old head to a young one and back again. Power remains in the hands of the teacher. While effective in one sense, �normal� classroom teaching does little to nurture the curiosity, inventiveness, or leadership capacity of active adult learners. Experiential education leaves primary responsibility in the hands, hearts, and minds of the learners. While experiential education may be guided, it is not controlled by the teacher. Integration of concepts acquired in varying disciplines happens in �real-world� settings where there are consequences, challenges, insights, and breakthroughs. In other words, the learning process is holistic. While we feel experiential education is a necessary component of a Sustainability major, we think the University should be flexible in the ways in which a student can gain this experience. Students should be encouraged to develop their own proposals for experiential education. A department or program might consider making an investment in a coordinator to assist students identify opportunities and make connections with situations that would provide appropriate experience. There are many resources available for students wanting to engage in experiential education including books, web pages, and non-profit organizations that help identify internship, volunteer and work opportunities. We believe the University of Massachusetts Amherst would benefit from partnership relationships with organizations that specialize in providing experiential education such as Shutesbury, Massachusetts based, Living Routes Inc. While there are other organizations that provide similar services, we have chosen to point to Living Routes as an example because of the close proximity of this educational non-profit organization to the UMass Amherst campus. Living Routes offers college programs based in ecovillages around the world, which empower students, educators, and communities to help build a sustainable future. Currently they have programs in India, Scotland, Australia, and North America (including one in nearby Shutesbury, MA). Living Routes is working closely with a consortium of Ecovillages and academic institutions (including Cornell University, University of New Hampshire, Pacific Lutheran University, and UMass Amherst). For more information see: http://www.livingroutes.org/. We recognize that an immersion experience in a sustainable living environment such as an ecovillage may not be appropriate for all students. Other opportunities for international experience and cultural immersion might be equally as valuable, depending on the interests of the student. We also believe that valuable experience may be gained by working in a local community such as Holyoke or Springfield. The range of experiential opportunities is broad. Regardless of the venue, we believe the particular experience chosen should help students integrate the concepts of economic vitality, environmental integrity, and social equity in a real-world business or community setting. The conceptual frameworks, facts and ideas learned in the classroom environment will �come alive� in a practice situation. Therefore we propose a Sustainability major should require a significant investment of time and energy in an educational experience guided and approved by the department offering the major. One semester residency and sustainable living/development courses taken on site in an ecovillage in the U.S. or overseas (see; http://www.livingroutes.org). � Internships with NGO's in the U.S. doing research, education and community organizing related to sustainability (many are listed at http://idealist.org). Local internships with educational non-profits working with youth such as Seeds of Solidarity farm in Orange, MA (see; http://www.seedsofsolidarity.org/). Internship and study programs with ECHO, Educational Concerns for Hunger Organization (see: http://www.echonet.org/). � Work with a community gardening group in Holyoke, Springfield or Boston. Volunteer for the Green Corps: Field School for Environmental Organizing (see; http://www.greencorps.org/). Special projects with local non-profits such as the Food Bank, Amherst Survival Center, or Not Bread Alone. Work experience and special development project in a cooperatively run business such as Earthfoods at UMass. Farm internships at a local CSA (Community Supported Agriculture) farm. � One semester at the International Center for Sustainable Human Development in Costa Rica (see http://www.cidh.ac.cr). � Volunteer or internship with CISA, the Community Involved in Sustaining Agriculture program, in the Pioneer Valley. � Global Exchange experiences (see http://www.globalexchange.org/). � Volunteer or work for an anti-hunger organization such as Food First: Institute for Food and Development Policy (see: http://www.foodfirst.org/). � Work and courses at Earth University in Costa Rica (for more information, see http://www.earth.ac.cr/ing/index.html). These are just a few examples of the types of experiential education that might be appropriate. We recommend that students work with individual faculty members or perhaps with a departmental program to develop their own proposals for experiential education that best serves their personal needs. The following readings are integral to understanding the conceptual foundation of education for sustainability. They were included in the hard copy of the report and are available here as links when available. Educating for the Environment: Higher Education�s Challenge of the Next Century by David W. Orr. Not included in electronic version of this report but available upon request to John Gerber at jgerber@pssci.umass.edu. Equity and the Environment: Social Justice Today as a Prerequisite for Sustainability in the Future by James K. Boyce. Not included in electronic version of this report but available upon request to jgerber@pssci.umass.edu. Sustainability Science by Robert W. Kates, et al. This may be found at: http://sustsci.harvard.edu/keydocs.htm - it is the first article listed. The Quiet Dawn by Ervin Laszlo. An excerpt from this article may be found at: http://www.noetic.org/ions/publications/r59Laszlo.htm.